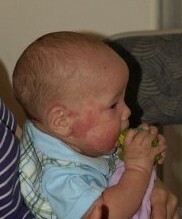 Like a lot of babies with eczema, my baby was born with it, and right from the outset his skin was dry and flaky. We bought almost every type of skin care product on the market, trying one after another unsuccessfully to control the scratching and discomfort it was causing him. He was also a terrible bottle drinker throughout this time, literally throwing bottles across the room, arching and fighting every single one. What should have been a nice bonding experience was a battle of wills to just feed him even tiny amounts of milk. It wasn’t unusual for a bottle to last most of the day by the time we could get him to finish it. It wasn’t until he was around six months of age that a doctor referred us to a specialist eczema/allergy clinic, where we were finally given the official diagnosis of eczema, possible milk protein intolerance, and given some particularly useful suggestions about layering of creams from lighter ones to thicker ones to keep the moisture in. We were told to wrap him tightly for sleeps, to help encourage a better sleep pattern and stop the damage from night time scratching. 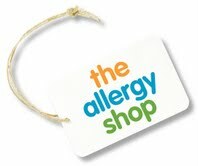 I can’t recommend highly enough getting a referral from your usual doctor to an allergy clinic or specialist. Most major hospitals have regular clinics where they can test for allergies or intolerances. Eczema associations and support groups can point you towards these clinics in your area. It helps to rule out possible triggers in the ongoing management of eczema or similar conditions. Wrapping or swaddling our baby was fine while he was small, but once he started to grow and become more active, it caused him more and more discomfort. He began sleeping even less, spending the entire time attempting to work his way out of the swaddles! We bought other baby wrap style sleeping bags. They worked for a short period of time, but were soon unsafe to continue using as he learnt to roll over, requiring free arm movement to be able to roll back. I was so desperate to keep him from scratching that I even resorted to a Safe-T Sleep system which wraps around a mattress and has velcro straps that are placed between a baby’s legs and around their tummy to hold them in place on their backs. Using this kept him in a wrap style sleeping bag for a little bit longer, but he eventually worked out how to roll over again even with this on, and so we had to transition to a normal sleeping bag. The only way this would work to stop the scratching was if I dressed my baby in an all-in-one suit with the foldover handcovers attached and then put the sleeping bag over the top of this. I was beside myself the day I realised that he no longer fit into the size 00-0 one suits and that ALL the manufacturers of these stop making them with handcovers after these sizes! I shopped high and low and could not find anything I could use safely with my baby, and we all NEEDED sleep badly. He also needed protection from the scratching to allow his skin to heal! And so the idea for the Bamboo Bubby Bag was born. I still can’t believe that there was nothing like this out there on the market! It is a one size fits 000-2+ sleeping bag (saving parent’s money - they are already spending so much on eczema treatments). 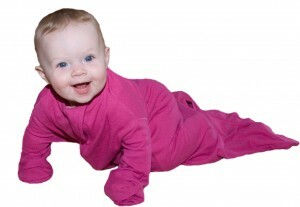 It is made of 70% bamboo/30% organic cotton fabric that is soft, breathable and thermoregulating. This is perfect for babies with eczema, since their condition already makes them hotter than others and sweat further contributes to the itch. The Bamboo Bubby Bag has a unique, completely enclosed adjustable sleeve design® which works similarly to the handcover concept on all-in-one suits meaning that it can guarantee a goodnight’s sleep for babies with eczema throughout their entire first 2+ years. Since designing the Bamboo Bubby Bag, I have been overwhelmed by positive feedback about the idea, and have recently launched Bamboo Bubby into an online business, sending out Bamboo Bubby Bags far and wide, helping many other babies with eczema sleep better and break the itch-scratch cycle. As a parent, there is nothing worse than watching your child suffer from a distressing condition like eczema, and I am glad that Bamboo Bubby has not only made a huge change to our lives, but also now those of so many others. Kelly Northey is the mother of a baby with eczema and the designer of the Bamboo Bubby Bag, a sleeping bag with unique, enclosed, adjustable sleeves that will fit babies from sizes 000-2+, stopping them from scratching during sleeptimes – perfect for babies with eczema or dermatitis. This entry was posted on Thursday, December 1st, 2011 at 10:20 am	and is filed under Others' Stories, Product Reviews. You can follow any responses to this entry through the RSS 2.0 feed. You can leave a response, or trackback from your own site.